The Volunteer for Liberty, V. 2, No. 32, September 17, 1938. You know, when we got all those new Spanish recruits late in May, we looked at them and a lot of us thought “Hells Bells, look at the kindergarten broke loose.” Why, those kids –they didn’t shave, some of’em would cry if you tried to transfer them from one squad to another; if you looked at them cross-eyed they’d holler for Mama. Baby-face! 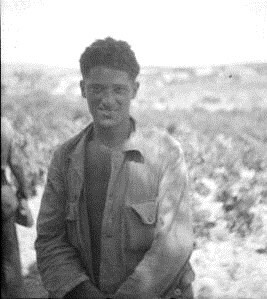 There were a lot of baby-faces among them, and the worst baby face I ever saw in Company 1 of the Lincolns was this kid Rafael. He says he’s eighteen years old; I say he looks fourteen if he looks a day. He’s not dry behind the ears; he never shaved; his spindly legs would go well with a hoop and a stick to roll the hoop; he talks all the time, day and night, you can’t shut him up. Well the [Co.] made him a runner. Imagine that a little baby-face like that, to make a runner out of him! Why hell that’s a responsible job; that’s a job for a guy with some maturity who will know his duty and do it, who’ll be able to stand up under a lot. You know what I mean? Well, you should know what I mean. So what? So you live and learn. We of Company 1 learned a lot on top of that hill 666 in the Sierra de Pándols. And one of the things we learned again was never to judge a guy by what he looks like. That was a hill, boy, that was some hill; that was a hill to make strong men weep and gnash their teeth. And it showed us all what young Rafael was made of, too. It was his first time at the front (after all he wasn’t born with a rifle in his hand), and he could barely control his enthusiasm. He insisted on having a crack at the Fascists. It didn’t make any difference, what we said to him; we told him to keep his head down, but do you think he did? He didn’t. Instead, he keeps popping that coconut head of his over the parapets, watching for movement from the Fascists’s hill. The peepholes in our parapets were too small for him; he couldn’t see well enough out of them. So he kept sticking his head and shoulders over the top and banging away with his rifle, which is as long as he is, and on one occasion he sat up on the sandbags take better aim. Don’t ask me why they didn’t pick him off; they’ve got pretty good snipers over there too. I wouldn’t know. But can you beat it? A young squirt like that? A babyface who ain’t even dry behind the ears yet?